10 Spirals with a life of 8 hours each and 2 metal supports in each package. Effective out of doors for a radius of several metres. 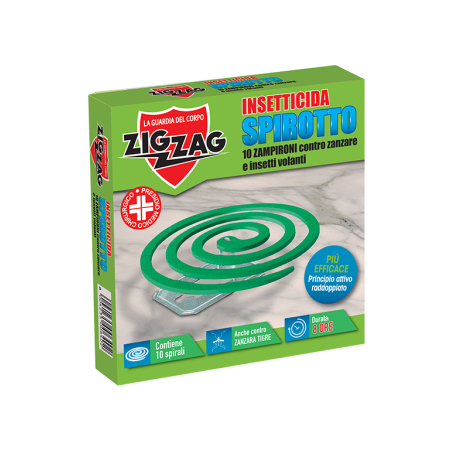 It repels and kills mosquitoes, tiger mosquitoes, sand flies and irritating and bothersome insects for the entire duration of its slow and regular burning. Delicately separate the spirals contained in the packet. Fit the round end of one spiral onto the provided metal support. Light the opposite end with a match or cigarette lighter. Check after a few minutes that the flame is out (if it is not, blow on it); a little smoking glowing tip should remain for slow and gradual combustion. If you want to extinguish the spiral before it is exhausted, simply break it and light it on when you need it again. The availability of two supports, allows the use of multiple Spirotti simultaneously to increase the area to be protected.